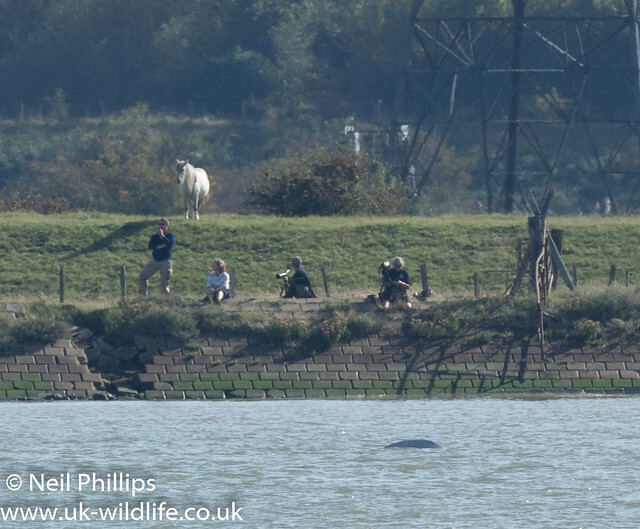 About 1pm today a friend excitedly told me that a Beluga whale had been seen just down the road off Coal House Fort near Tilbury. I got less excited when I found out it was on the Kent side, but it was still a cetacean in the Thames, and an Arctic one at that! I was fortunate that it was today as I could drop everything and head there. As I arrived there were some folk with scopes heading along the sea wall and I joined them. From where we were there was a lot of glare from the Sun in the area we had heard it was swimming in, so we headed East to try and get a better angle. On the other (Kent) side of the shore there was quite a crowd gathering. I ended stopping not to far from Tilbury Power station (or what is left of it!) with 2 other birders. Eventually they picked it up and kindly got me on to it. It was hanging around the barges on the opposite bank. Not the best photos as it was a long way off! I tweeted a back of the camera shot and had some folk from the media asking to use my photos withing minutes! Some on the Kent side seemed to be getting great views. 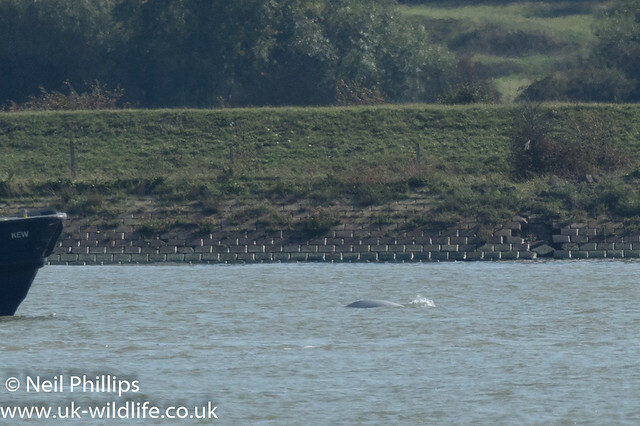 So what is this an Arctic species of whale doing in the Thames? Well there is a population in the St. Lawrence Estuary, Canada, on the other side of the Atlantic, which is at a similar latitude. Of course that side of the Atlantic is much cooler as it is not warmed by the North Atlantic current like ours. So this species is in much warmer waters than usual. So what about past occurrences? According to Sea Watch foundation there were only 17 recorded sightings in the UK before 2 were seen of Northumberland back in 2015, so they are a rare occurrence near our shores. The previously southern most record in the UK is Scarborough, all the way up in Yorkshire, so this looks like the Southern most record in the UK (and perhaps Europe) at least. As to why its so far south I guess we can only speculate. 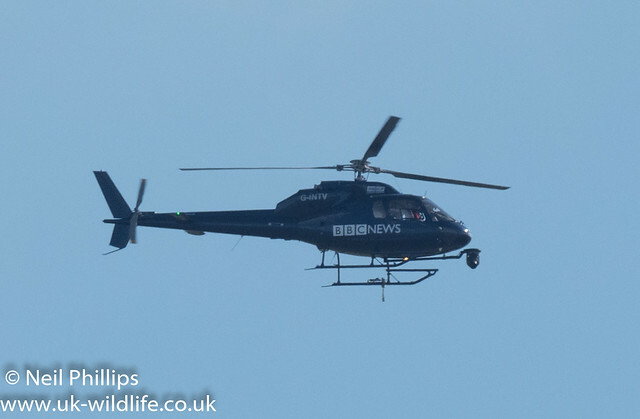 It is reported to be a juvenile, so may have just got a ‘bit’ carried away dispersing. But unless you have not seen the news or summer (or get you ‘science’ from climate change deniers!) you will have heard there were record temperatures in the Arctic last winter and this summer. 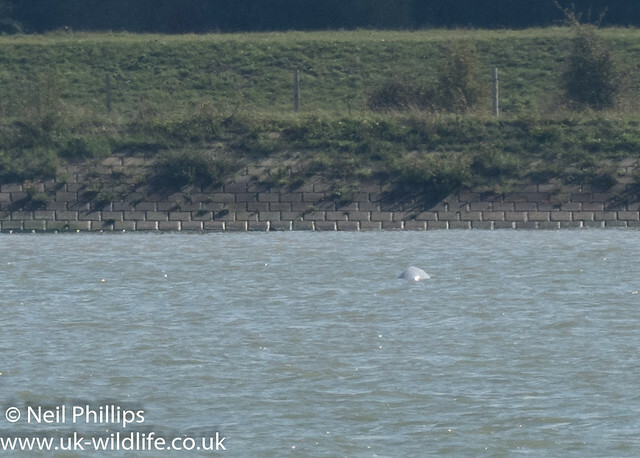 Its hard not to wonder if this has had some affect on the belugas food supply forcing it to wander further. If more show up further south than usual of course this may be an indication something is wrong. But what fate awaits this individual? Well most folk will be aware of the Northern bottlenosed whale that ended up much further inland in central London and sadly died. This was a deep water species that could find no food in the Thames (or the North sea which is most likely came) so had no chance. This whale is further out and seemed to be catching food. Constantly diving and not coming up for minutes at a time, swimming strongly. Hopefully it will find its way out, though it did seem to be heading inland when I last saw it, others have since reported it going in the direction of the sea. If it does get stuck there do appear to be plans to help it forming too. 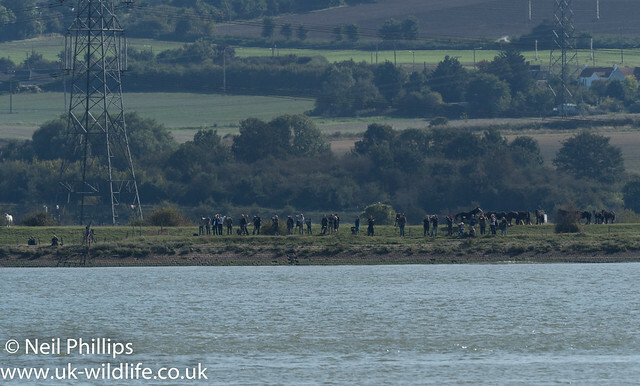 A Police boat is on hand near Shorne Marshes to protect the #Beluga whale in the Thames from unnecessary disturbance. Efforts to shepherd it back out to sea will likely come with the turning of the tide this afternoon. So fingers crossed it will be OK.